Contemporary and stylish, this exclusive estate features 8 luxuriously appointed beachfront and seaview villas. Amenities satellite plasma TV, DVD/CD player, outdoor speakers, full air-con, fully-equipped kitchen, gas BBQ, free broadband WiFi internet. 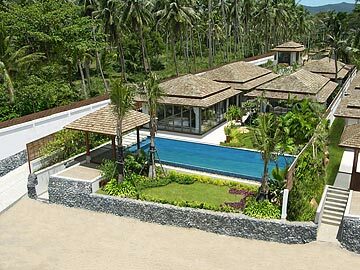 Dhevatara Residence comprises 8 villas in a beautiful beachfront location on Bophut bay on the northern coast of Koh Samui. This exclusive estate is designed in contemporary tropical style, with each beachfront villa composed of several shingle-roofed pavilions arranged around a private swimming pool. Foldaway glass walls create an intimate indoor-outdoor living space, with polished terrazzo floors and vaulted ceilings and recessed halogen lighting. The villas are fully equipped with large LCD TV/DVD, stereo systems, satellite TV, and complimentary WiFi internet connections. A wide array of restaurants is within walking distance along the beach. The 5 beachfront villas each have four air-conditioned en-suite bedrooms, 2 with king-size beds, a twin bedroom, and a master bedroom with a 4-poster king-size bed at the poolside, overlooking the sea. The living rooms are also located adjacent to the pool, with the open-plan dining room and kitchen in a separate pavilion. Both the dining room and living room are air-conditioned, with concertina glass doors. The pool of each villa is crossed by large stepping stones, to a beachfront sala pavilion, offering a shady retreat in the day, and a second al-fresco dining venue. From the sala, steps lead down to the beach. The 3 seaview villas are located just behind the beachfront villas, and are constructed on 3 floors to maximize the views. On the ground floor, an en-suite double bedroom is located off the private parking area and courtyard. The first floor includes the main living area, swimming pool, deck, open-plan kitchen, living room, and dining room, and two further en-suite double bedrooms. On the top floor, the master bedroom suite includes a lounge area, and a large en-suite bathroom with bath tub and phenomenal views. Similar in design to the beachfront villas, with terrazzo floors and teak shingle roofs, the seaview villas are only a few steps away from the beach. Located on Bophut bay in the north coast of Koh Samui, 5 minutes drive from the Fisherman's Village, 15 minutes from Chaweng, and 10 minutes from Samui’s international airport. Santiburi Championship golf course is 15 minutes drive away.